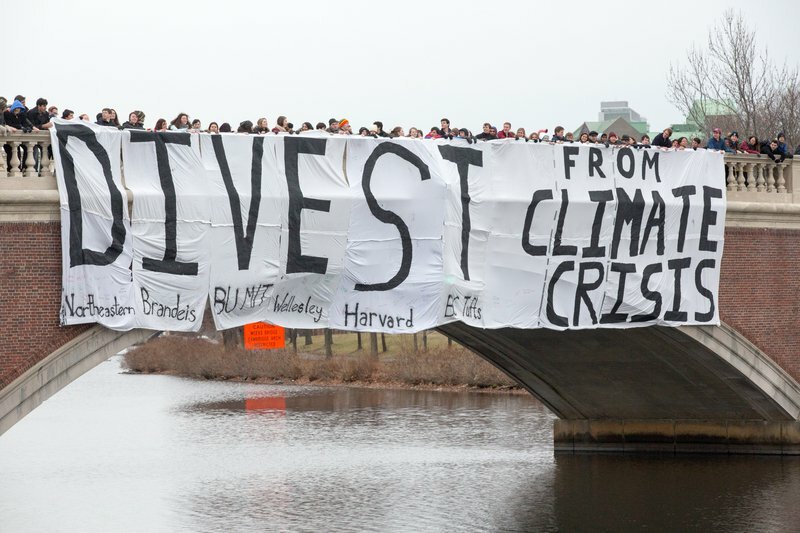 Divestment activists in Boston. Credit: Demotix/Paul Weiskel. All rights reserved. The Chicago-based MacArthur Foundation recently announced that it’s giving $50 million towards curbing global climate disruption by significantly reducing greenhouse gas emissions. Great news right? Maybe, or maybe not—this amount is tiny when compared to the scale of the problem, so it all depends on how the resources are utilized in practice. And on that question, the Foundation’s strategies reveal the ongoing limitations and contradictions of conventional philanthropy. The first problem is that MacArthur has chosen to support a few large established organizations instead of nurturing the diverse ecosystems of grassroots organizations and social movements that are emerging at the center of a new and vibrant climate movement. The ‘big greens’—groups such as the Natural Resources Defense Council, the Environmental Defense Fund and the Sierra Club—do some important work. But they are already well funded, and crucially, they are often less connected to communities of color and low income communities who bear the brunt of the impact of climate change. From nature, it’s clear that diverse ecosystems are more resilient than monocultures, and the same is true of civil society. Inter-connected networks of organizations with strong roots have a bigger impact on social change than a few large intermediaries or advocacy groups, however well-funded they may be. Change in one small segment of an ecosystem can yield much bigger, system-altering but often unpredictable changes overall. In 2010, for example, the state of New Mexico enacted some of the most forward thinking environmental regulations in the USA, including stricter greenhouse gas standards and the banning of Uranium mining anywhere on the Navajo nation. These shifts did not come from top-down ‘big-green’ advocacy and campaigning. In a conservative-leaning state, they came from grassroots organizing and long-term efforts by local environmental advocacy groups—essentially, action by angry and organized communities who were directly impacted by the issues at hand. But despite the well documented importance of grassroots action in social change, only 12 percent of foundations in the United States directed 20 per cent or more of their climate funding to marginalized communities in 2011. Between 2000 and 2009, grant-makers gave $10 billion to environment and climate work, primarily to top down advocacy strategies. Yet there have been no significant policy wins in this arena since the 1980s. In this context, a recent article in Greenbiz magazine is worth reading. It emphasizes the need to chart new and experimental paths in climate change funding. These include supporting under-represented or unusual ideas and voices in the climate conversation, and trying more “weird stuff” in the time honored tradition of discovery by trial and error. By contrast, the MacArthur Foundation’s strategies seem dated—distanced from the people who are actively working on climate change at the community level and disconnected from any democratic or broad based input. Small, medium-sized, unusual and grassroots groups have, for the most part, been left out. Frontline communities and individuals are nowhere to be seen. There is nothing in the $50 million plan to make anyone, including the MacArthur Foundation, or extractive industries, or governments, or others responsible for greenhouse gas emissions remotely accountable for their roles in contributing to climate change. Is it philanthropy’s job just to fund the biggest and highest profile groups? This impetus to support “established organizations” is problematic. What major problem was ever solved in this way? And if climate funding has largely focused on the same organizations and approaches for the last twenty years without any significant policy victories, what’s the point of continuing in this manner? It would be interesting to know how MacArthur came to their decisions around climate funding. Did they consult with community members, grassroots leaders and climate activists, or survey the climate movement for groups that might be on the cutting edge of new solutions to whom a micro-grant might have made a major difference? Did they consider what kind of ripple effects might flow from community-based decision-making approaches to their ‘big bet’ commitment? Involving members of the communities affected by climate change in grant-making decisions has a potentially transformative impact on strengthening the conditions for success. It generates more ideas and greater wisdom, and much more buy-in for the work that must be done. And it builds trust, cooperation, authenticity and accountability for the long term instead of extending the short term, patron-client relationships that pervade conventional philanthropy. But when asked about divestment from fossil fuel companies, the Foundation’s response is this: “divestment is not a simple matter and the Board investment policy does not permit divestment to assert policy preferences, censure, or to gain political leverage.” In other words, while MacArthur is happy to fund others to push for policy change, it is unwilling to implement the same changes inside its own organization. And if the Foundation declines to follow its own advice then why should anybody else take it seriously? How will organizations that are funded convince or incentivize policy makers, corporations and members of the public to make major shifts in their behavior? Sadly, it’s not uncommon for foundations to invest in the same companies that contribute to the looming climatic disasters their grants are trying to prevent. But the existence of such an obvious disconnect between principle and practice creates an inescapable contradiction at the heart of MacArthur’s strategies, and undermines the impact of its efforts. MacArthur’s response mimics the ‘pass the buck’ mentality of shirking responsibility for action around climate change that’s already seen from governments and businesses all round the world. At the same time, the Foundation’s president, Julia Stasch, is on record for stating that climate change “threatens to undermine virtually everything we care about as human beings.” If the Foundation holds this statement to be true, shouldn’t it transform its own investment practices? In 2014 the Rockefeller Brothers Fund made a commitment to divest from fossil fuels. This announcement came just one day after hundreds of thousands of people across the globe participated in the climate marches in New York and other cities—an impressive outcome from grassroots groups, ‘big greens’ and foundations working together in a movement with solid traction. While the field of ‘impact investing’ is growing rapidly, it’s not without its challenges. It does, however, give foundations the tools they need to integrate their endowment investment policies into their broader mission for social change. Facing up to the implications of climate change in this way could mark the beginning of a deeper, more creative and potentially transformative phase in the evolution of philanthropy. But this isn’t going to happen without much greater clarity, consistency, courage and commitment. These are the essential ingredients of any strategy aimed at confronting a crisis of planetary proportions.